Uwe Steinmuller and Juergen Gulbins' book Fine Art Printing for Photographers is now available from Amazon. "Today's digital cameras provide image data files allowing large-format output at high resolution. At the same time, printing technology has moved forward at an equally fast pace bringing us new inkjet systems capable of printing in high precision at a very fine resolution, providing an amazing tonality range and longtime stability of inks. "Moreover, these systems are now affordable to the serious photographer. In the hands of knowledgeable and experienced photographers, these new inkjet printers can help create prints comparable to the highest quality darkroom prints on photographic paper. 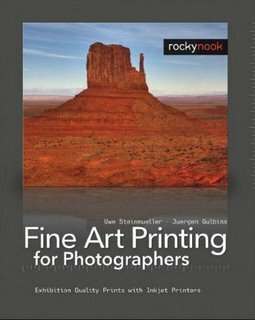 "This book provides the necessary foundation for fine art printing: The understanding of color management, profiling, paper and inks. It demonstrates how to set up the printing workflow as it guides the reader step-by-step through this process from an image file to an outstanding fine art print." to create "fine art" prints with printers that are more of a prosumer grade, namely those that are less than $500? Sort of. The problem is that most of the small printers are dye-based, and print longevity can be anywhere from fairly good to really miserable. I wouldn't say that a print that fades like cheap curtains in the sun after a couple of years should really be called a "fine" print. Other than that, the only real limitation is size; most of the letter-sized printers can only go about 10.5" in width. But if you like smaller prints or you're going to mount them in an album, there's nothing really wrong with that. I use an HP 8450 which with HP's encapsulationg papers is supposed to have pretty good print longevity. The printer is cheap but supplies are pretty expensive. I've never made a B&W print I'm 100% satisfied with, although it's better with B&W than most small printers, but the color prints look really good. One option for cheaper/older printers is to use 3rd party inks to breathe new life. I have dedicated my old Epson 1290 to B&W with hextone inks from MIS (although there are many options) and using a very cheap RIP called QuadtoneRIP. These two things combined produce superb results and, as the inks are carbon and pigment based, the prints have good longevity. You could also do the same with 3rd party pigment colour inks, but then you would have some additional profiling work to be done, but there again if you only use a small number of papers getting the profiles created by others also will not break the bank. I know what I am saying is not exactly ground breaking, but I think many people are put off by mis-conceptions of complexity. You might want to consider the Epson C8X series of printers. Not only are they dirt cheap, they use pigment ink and produce very long lasting prints. The only downsides are the limits to 8.5 inches but consider using larger paper cut down so you can print fairly large panoramas. The second limit is that they only work on matte paper. For fine art work this is hardly a serious limit, at least in colour work. For black and white, I'd advise picking up a used printer of the 860, 1160 type and use dedicated black inks in it and drive it with quadtone rip. The Epson 1280, which does 13' wide prints, can be had for less the $300. With the replacement of the Epson inks with MIS or Cone B&W pigment inks you can have a B&W printer that will produce "fine" prints for under $500 and will last as long as any print produced with stock Epson, HP or Canon inks and look better. MIS also does color pigment inks for the most all Epson printers including the 1280.